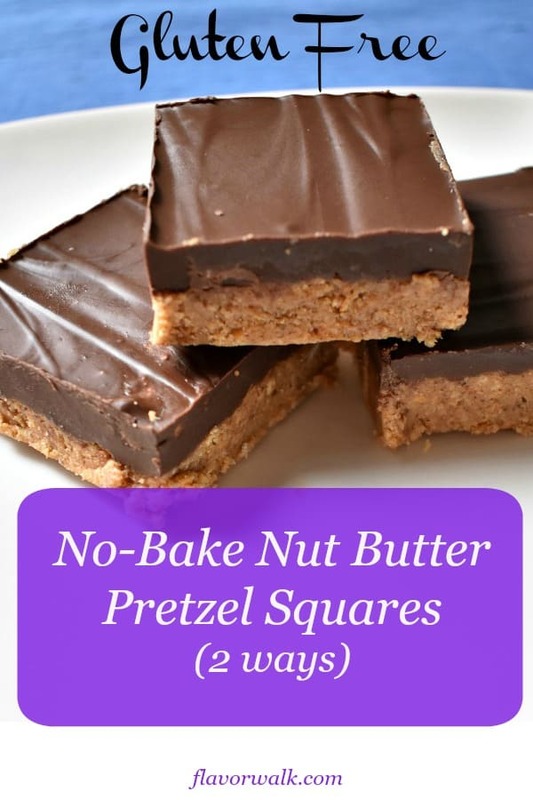 No-Bake Gluten Free Nut Butter Pretzel Squares are easy to make, need only a few ingredients, and will disappear quickly! Simple ingredient swaps make it easy to customize them to fit your taste buds. We’ve had a stretch of warmer-than-average temperatures around here lately. Turning on the oven to heat up an already warm kitchen was not something I wanted to do. However, regardless of the temperature outside, you still need a little sweet treat to add some extra flavor to the day. Whether it’s for dessert, a mid-afternoon snack, or a late-night indulgence, something tasty with chocolate is always a good idea! 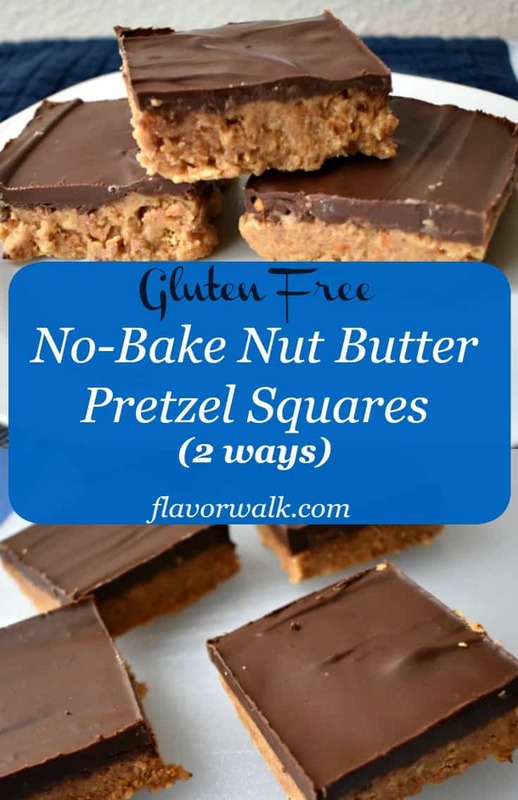 That’s where No-Bake Gluten Free Nut Butter Pretzel Squares come into play. This recipe requires no baking and only a handful of ingredients. And two of the ingredients can be swapped out to match your favorite flavor combination. 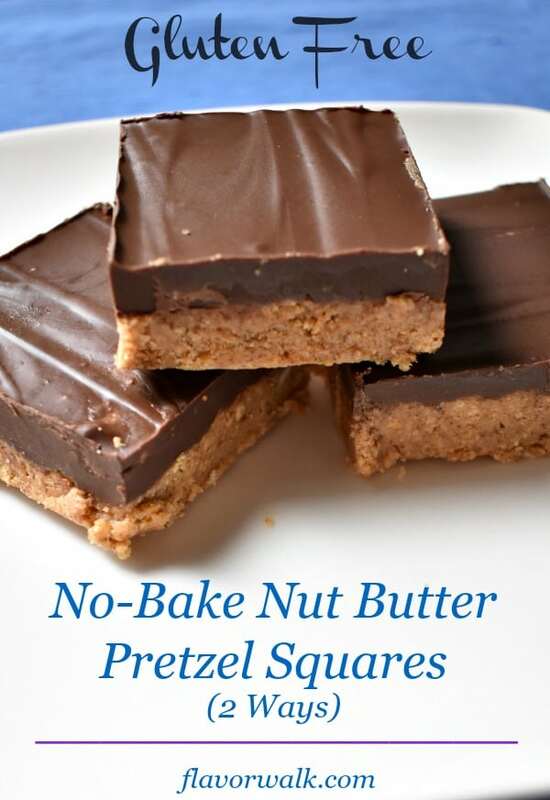 Considering all the different nut butters available and all the flavors of chocolate chips, there are unlimited variations of these pretzel squares. 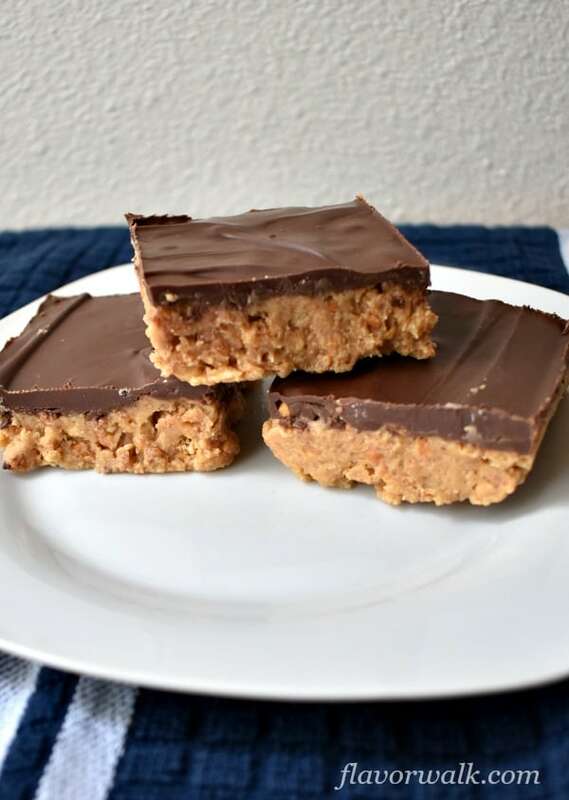 The two variations I made include almond butter with dark chocolate chips (my favorite) and peanut butter with semi-sweet chocolate (my husband Jim’s favorite). This is the second recipe I’ve adapted from Trisha Yearwood’s cookbook, “Trisha’s Table.” My Lemon Cookies with Lemon Glaze was the first recipe I adapted, and I plan to adapt many more. 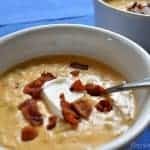 What I love about Trisha’s cookbook is most of the recipes have a healthier twist. It’s fairly easy to remove the gluten from the recipes and still produce great results. 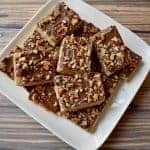 The first time I made these No-Bake Gluten Free Nut Butter Pretzel Squares (with almond butter and dark chocolate chips) I started with only 2 cups of pretzel sticks that I ground up in a food processor. I quickly discovered I needed more pretzel crumbs to get the pretzel/nut butter layer to set up. Grinding up another 2 cups of pretzel sticks, resulting in a total of 2 cups pretzel crumbs, did the trick. The extra pretzel crumbs were able to absorb all that almond butter, powdered sugar, and melted butter goodness. Once I had the right consistency for the pretzel layer, I spread the mixture into the bottom of a 9-inch square baking pan. Using a rubber spatula helps to evenly distribute the mixture around the pan and into the corners. Two minutes in the microwave, stirring at 30 second intervals, had the remaining 1/4 cup of nut butter and the chocolate chips melted and smooth. The melted chocolate mixture is spread over the top of the pretzel layer and then the tasty confection is ready to go in the refrigerator. Since I wasn’t ready to serve these pretzel squares right away, I waited for a couple of hours before cutting them. Leaving them in the fridge for longer than 30 minutes didn’t affect the results, but it did make it more difficult to cleanly cut the chocolate layer. The second time I made these No-Bake Gluten Free Nut Butter Pretzel Squares, I used peanut butter and semi-sweet chocolate chips. The preparation time was much quicker because I now knew how many cups of pretzel sticks I needed. Once they’d been in the fridge for 30 minutes, I quickly cut them into squares and returned them to the fridge to be enjoyed later. Jim isn’t a dark chocolate fan, so this version with the semi-sweet chocolate chips was more to his liking. He really prefers milk chocolate, so I’ll be making another version in the near future. Use enough gluten free pretzel sticks to produce 2 cups of pretzel crumbs (I needed 4 cups of the whole sticks). Using less crumbs will result in a base layer that doesn’t set up completely. Allow the pretzel squares to set up in the refrigerator for at least 30 minutes before cutting. Cut the squares after 30 minutes even if you don’t plan to serve them right away. I find the longer the pretzel squares stay in the refrigerator, the more difficult it is to get clean cuts without the chocolate layer breaking into chunks. Any leftovers should be kept in the fridge, or they can be stored in the freezer for several weeks. 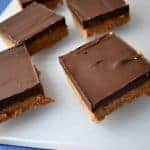 When you want an easy to make sweet treat, that requires no baking, give these No-Bake Gluten Free Pretzel Squares a try. With so many possible variations, you’re bound to find a flavor combination that’s perfect for you! Enjoy! 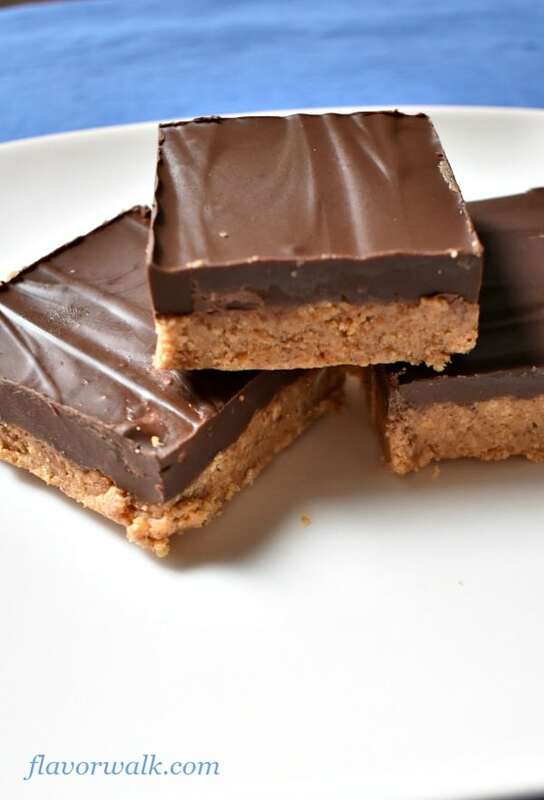 If you like this recipe, follow my Gluten Free Brownies and Bars board on Pinterest. Using a food processor, pulse the pretzel sticks into fine crumbs to yield 2 cups. You'll need approximately 4 cups of pretzel sticks to create 2 cups of crumbs. Stir together the pretzel crumbs, melted butter, powdered sugar, and 1 cup of the nut butter, in a medium bowl, until thoroughly combined. Place the pretzel mixture in an ungreased 9-inch square pan. Using a rubber spatula, press the mixture evenly around the bottom of the pan. Microwave the chocolate chips and remaining 1/4 cup nut butter in a microwave safe bowl on high for 30 seconds. Stir the mixture. Alternate microwaving for 30 seconds and stirring until the mixture is smooth. Spread the melted chocolate and nut butter mixture over the pretzel layer. Refrigerate for 30 minutes and allow the mixture to set up before cutting into squares. 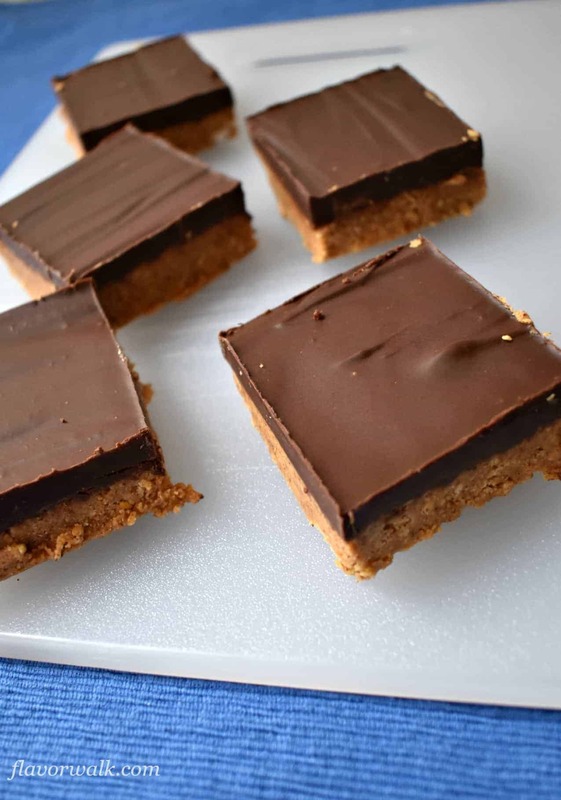 We enjoy these squares made with either almond butter and dark chocolate or peanut butter and semi-sweet chocolate.